Visit Myrtle Beach's Summer Tree Village, a wooded complex off of Shore Drive which offers the excitement of the seaside and the peaceful quiet of wooded grounds with walking paths. 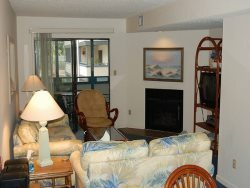 This lovely two-story two-bedroom condo features a fireplace and an excellent view of the pool. This very spacious condo offers comfortable furnishings, 2.5 baths, classic beach decor and two balconies. This condo sleeps six people with one king bed, two twin beds and one queen-sized sleeper sofa. Additional features include a washer/dyer, wet-bar area, two TV's, one VCR, one DVD and one CD player.